Learn how you can make the most of Reply's prospect list segmentation and actually increase your campaign performance/results by up to 760%. The Lists tab can be found on the People page. Lists are used to segment your contacts and further organize your outreach. 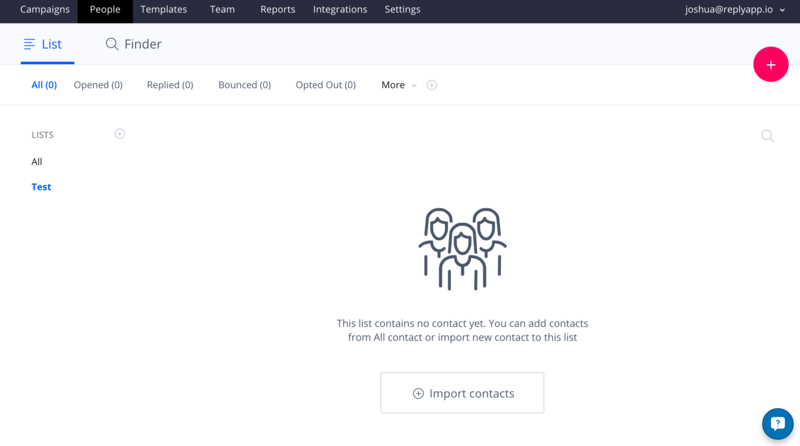 Unlike Filters (located horizontally near the top of the screen on the People page) or Campaigns, you can have the same contact in as many lists as you would like. You can create as many lists as you prefer. The most typical use cases for creating multiple lists are for segmenting clients if you have multiple team members working in the same Reply account. To transfer contacts to specific lists, just select them from the All list. You will see new drop-down menus appear above your contacts. Press the Lists option and you will see all of your available lists. Select the destination you want to move the contacts to, and press Apply. Each list provides the user information on the tracking data based on the contacts within each respective list. You can find out the number of Opens, Replies, even Opt-outs, of each contact in the chosen list. You can also add contacts to a list directly from the Import Contacts page while uploading a .CSV file.